the Financial Insights Innovation Awards top 30 technology initiatives list. 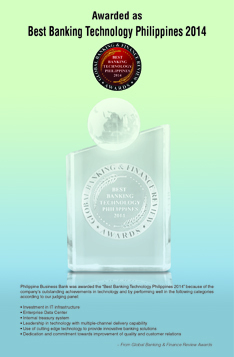 Other technology iniitatives of PBB was also cited during the 2011 and 2012 IDC Asian Financial Services Congress. The Asian Financial Services Congress on its 10th year is designed to gather industry's preeminent thought leaders, practitioners and innovation champions alongside IDC' Financial Insight's expert team of consultants to help define the industry's next decaded. 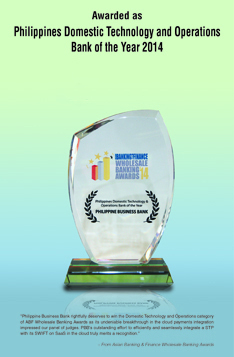 leading technology, media, research and events company.